During the past spring semester, Dr. Chang was invited as the distinguished speaker by Hong Kong Society for Transport Studies and by Northern Chiao-Tung University of China. The topics of discussion were ?Development of a Multi-modal Emergency Evacuation System, a Case Study of Baltimore City,? 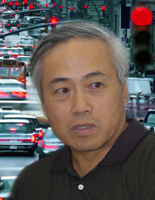 (Hong Kong) and ?New Directions for Developing the Intelligent Transportation Systems in China? (China). Upon the invitation of Taiwan University, Dr. Chang will also be presiding over ?Advanced Freeway Control? workshop for Taiwan transportation researchers and practitioners sometime in late August of this year.